Read about John Adams, one of the founding fathers and staunch defender of the Declaration of Independence. According to Wikipedia, historian Robert Rutland described John Adams as "the most captivating founding father on most accounts". While Benjamin Franklin is described as a charming genius, Thomas Jefferson is known as the writer of the Declaration of Independence, and everyone is familiar with General and then President George Washington, less is known about John Adams - and yet we owe him a great debt for his brilliant defense of the Declaration in 1776. Born in Quincy, MA, in 1735, he attended Harvard College but instead of becoming a minister, he became a lawyer. An outstanding orator, Adams nonetheless felt that he never quite had public approval and acknowledgment. He married Abigail Smith of the notable Quincy family in 1764, and their loving partnership for 54 years may be the thing most people know John and Abigail Adams for. They are the parents of 6 children, only 2 of whom outlived their father. Adams entered politics with his opposition to the Stamp Act of 1765. In 1772 he systematically and vigorously defended Massachusetts against British imperial policy. While representing Massachusetts in the Continental Congress between 1774 and 1778, he nominated George Washington as commander-in-chief of the army and, almost from the beginning, supported permanent separation from Britain. On 7 June 1776, Richard Henry Lee from Virginia presented a resolution to Congress proposing, in 1 sentence, complete dissolution of all ties with Britain. John Adams seconded the resolution. While no consensus was reached that day, a five-man committee was established to rewrite a formal Declaration and given less than a month in which to do it. Benjamin Franklin, as the most senior member, had the right to write the document but excused himself because of poor health. Next in line was John Adams who, recognizing the superior writing ability of Thomas Jefferson, somewhat reluctantly handed the task to him. All five members of the committee (the other two were Robert R. Livingston and Roger Sherman) contributed to the wording and ideas based upon Lee's Resolution. When the document was completed and presented to Congress on 2 July 1776, John Adams orally defended the Declaration on the floor of the House. 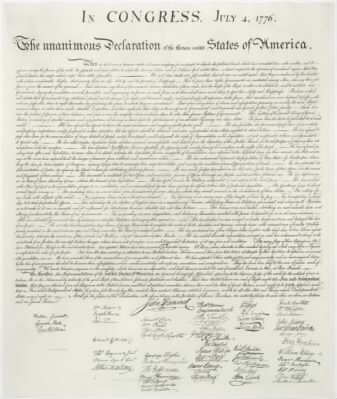 It was passed by Congress on 2 July 1776, with 12 of the 13 colonies formally approving it on the 4th. John Adams served as the first Vice President (to George Washington) between 1789 and 1797, and as the second President from 1797-1801, with Thomas Jefferson as his Vice President. By this time, relations between Adams and Jefferson had become strained; elections were based at that time on number of votes, not on party affiliation or selection as a "running mate". When Jefferson was inaugurated as the third president, Adams did not attend the celebrations, using the recent death of his son as an excuse to be absent. Adams and Jefferson did not reconcile until 1812, after being urged to do so by a mutual friend, Benjamin Rush (who also signed the Declaration of Independence). Until their deaths on the same day, 4 July 1826, the two men remained close friends. That day was the 50th anniversary of the signing of the Declaration. You can see their signatures by clicking on the image to the right. John Adams' signature is in the right column, 4th name from the top.